Our beautiful son, Thomas, was diagnosed with a malignant brain tumor (ATRT) at Children’s Hospital Colorado in February 2007, at age 2 years, 9 months. He was a previously healthy, happy little boy. 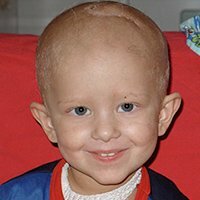 The tumor was successfully removed and Thomas commenced a course of maintenance chemotherapy. He underwent a stem cell rescue in April. An MRI scan around this time was normal. In May, Thomas started high dose chemotherapy. He had his first autogulous stem cell transplant and his counts recovered. A routine MRI in July revealed a relapse of the tumor. Our options were hospice or radiation in combination with chemotherapy. Thomas was 3 yrs old. We chose radiation. Thomas began to mistrust people and was scared and fearful of the hospital and its staff despite their gallant efforts to make him happy. In November, our hopes were raised when we were informed of a new treatment for ATRTs as a result of a study undertaken at Boston Children’s, in which there were confirmed cases of survivors of relapsed ATRTs. That week we launched into more intensive chemotherapy, but with renewed hope. Another 2 stem cell transplants over the course of the next couple of months, and multiple transfusions later and another clear MRI resulted. But on June 21st, after a couple of days feeling unwell and a vague headache, a MRI revealed extensive relapse and we were given no other choice but to take Tommy home with us to die. We were heartbroken. Tommy survived a grand 10 weeks, he passed away on August 31st, 2008. It was a brave, courageous fight to the end and we are so proud of him and miss him terribly. We are indebted to Dr. Nicholas Foreman and the Neuro-Oncology team at Children’s Hospital Colorado who gave Thomas the best possible chance of survival and gave his family hope and comfort. Thomas is survived by his mother and father, his brother James, and his sister, Sarah.